Main Drain Cave – Logan Canyon (Tony Grove) – WARNING! EXPERT CAVERS ONLY! 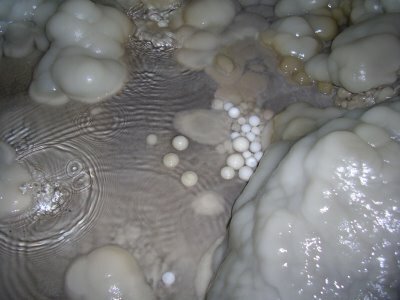 During the summer season of 2005 mapping occurred in several “small” caves in the tony grove area. To aid in the effort, Brandon Kowallis led a cave mapping workshop to get new cavers the know-how in mapping caves. Over the season, 10 small caves were mapped. Brandon and Vern Bowden together produced 18 maps for most all of the small caves surveyed in 2005 and previous years. The heavy snowpack of 2005 created large concern and delays in the exploration efforts in Main Drain Cave. The initial trips started in mid-July with the entrance pit still heavily coated with ice and snow. At the end of July, the first trip to the bottom of the cave discovered the 2004 depth record’s 45-ft pit completely full of water and back flowing down the passage with waist deep water. By mid-August, the bottom push resumed with a crew of 6 cavers with about a dozen more begging to come along. Following the main lead, we found a large room where two streams flowed into a 15-ft diameter pool. The survey ended at the edge of this 25 to 30 foot deep pool. A new depth record of 1227 ft was reached. With no other downstream leads, the project’s participation waned. All of the remaining leads continue upstream. However, the first upstream mapped lead led to a large breakdown room with 3 converging waterfalls. Dave Shurtz led several other survey trips to clean up the leads in the middle depth of the cave. After several trips Dave is close to completing the survey of the upper section of the cave. These upper leads have shortened the 450-ft vertical gap between Lucifers Lair Cave and Main Drain Cave to 300 ft. This weekend (February 2014) Divers are going to the bottom to dive the bottom pool to see if it is a sump or filled up to that point. 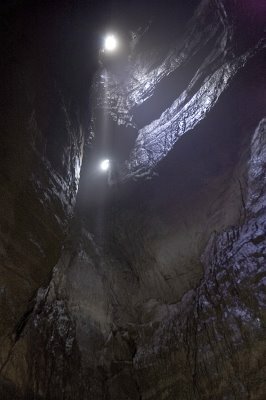 This could be a trip to break the top 5 deepest caves in the US. I will keep you update. Cave On! 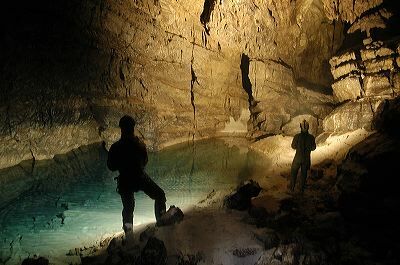 This entry was posted in By county, Cache County and tagged Caving in Utah, Caving In Utah County, UT Caving, Utah caves. Bookmark the permalink.